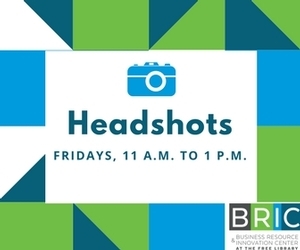 Fri, August 17, 2018 11:00 A.M.
Get a FREE headshot photo taken at the Business Resource & Innovation Center (BRIC)! Headshots are a new service for entrepreneurs, nonprofit professionals, job seekers, and more! Use your photo to enhance your professional portfolio and make your LinkedIn profile stand out among the selfies! Headshots will take place on Fridays from 11:00 a.m. to 1:00 p.m. (The last person will be taken no later than 12:50 p.m.) Photos will be delivered via email within seven to ten business days. No registration is required; access is on a first come first serve basis. PRO TIP: Bring an extra shirt for a second look; mirror available to check appearance. Note that our background is gray. For more information, please email headshots@freelibrary.org. Fridays｜11:00 a.m. to 1:00 p.m.